The North Carolina State Bureau of Investigation has agreed to assist UNC Police in the investigation into the toppling of the Confederate monument known as Silent Sam on the Chapel Hill campus this week. UNC – Chapel Hill and UNC System leadership announced the move in an updated statement on Tuesday night. Silent Sam surrounded by two layers of barriers before protest in August 2017. Photo via Blake Hodge. The letter – signed by UNC – Chapel Hill Chancellor Carol Folt, Board of Trustee chair Haywood Cochrane, UNC System President Margaret Spellings and Board of Governors chair Harry Smith – came after questions were raised regarding the policing tactics from the protest Monday night where the monument was pulled down from its pedestal. During a protest in August 2017, two layers of barricades were set up surrounding the statue with police stationed between the monument and protesters. 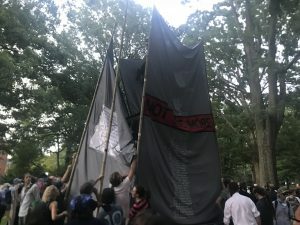 There was a heavy police presence on Monday night scattered across McCorkle Place, but the police did not stop protesters from moving toward the monument. Protesters unfurled large banners at Peace and Justice Plaza at the beginning of Monday’s protest before moving across Franklin Street to the Confederate monument. The large banners were then set up around Silent Sam, covering the statue from view. The protesters ultimately tied a rope around the monument, under cover of the banners, and pulled down the statue. Silent Sam protest in August 2018. Photo via Blake Hodge. These policing tactics led some, including Board of Governors member Thom Goolsby, to ask if police had been ordered to “stand down” and allow protesters to pull down the monument. 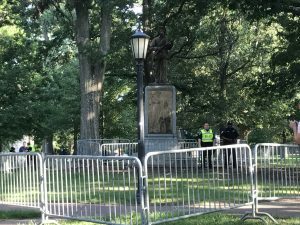 “Safety is always paramount, but at no time did the administration direct the officers to allow protesters to topple the monument,” UNC officials said in Tuesday’s update. Campus police initially said a full investigation was underway, the State Bureau of Investigations is now assisting the inquiry. One individual – 27-year-old Ian Paul Broadhead, of Vilas, North Carolina – was arrested by UNC Police during the initial protest Monday night, well before the statue was pulled down. Records show he is charged with resisting arrest and concealing one’s face during a public rally. Goolsby had additional “critical questions” that he announced via a Youtube video published on Tuesday. The statue was removed by campus workers after Monday night’s rally, but university officials have not indicated where it is being stored or what future plans are for the site.